Inuyashiki is a tale of your average downtrodden salaryman, Ichiro Inuyashiki. It’s immediately established that he gets zero respect from his wife, let alone his boss, and just ten minutes in, Ichiro also discovers that he has cancer PLUS his wife tells her loser of a husband to get rid of his dog, the man’s only friend (never mind best). Well, one evening while walking the pup in a nearby park, a white light envelops Ichiro, who wakes up the following morning with zero recollection as to what the hell happened. So he heads back home to have breakfast with the rest of the fam, but cannot, cuz Ichiro’s now a robot! Or something like that; his new form cannot process miso soup. A more noteworthy attribute is healing powers; when an injured pigeon that Ichiro handles becomes 100% by just holding it in his hands, he decides to swing by area hospitals and cures everyone of their serious maladies (though he keeps his profile low and is known by the public at large as an unidentified miracle worker). But Ichiro wasn’t the only one at the park that night; Hiro, a high school student was close by, who also enveloped by the light and as such also received super powers. When revealing this to his best buddy Ando, he claims that he’s a super hero and demonstrates this by blowing a pigeon out of the sky by pretending his hand is a gun? Seems more super villain-ish than anything else. And Hiro becomes more or less a full-fledged bad guy when… after spending time with dad, who seemingly loves his son a whole lot, but if he really did, why did he leave mom and get a new wife plus new kids… decides to take that aggression out on some innocent family while heading home. So Hiro is no hero, yet he’s not a total jerk either; it takes zero effort to add dollars to his bank account, which he happily passes along to Ando as spending money, tho his best bud wants no part… especially after also discovering that Hiro killed that family from the news. Hiro also loves his mother dearly, as established by the resentment towards his father. When the police identifies him as the killer, Hiro’s mother is bullied by the public over her son’s crimes, ending with her suicide. Which causes her son to completely snap and go on a killing spree, which is when the film truly comes to it’s own. Because up until this point, the movie has actually done an admiral job of doing what has always seemed, in mind, impossible for a movie produced in Japan: by successfully reproducing elements found in America, in this case a super hero flick. 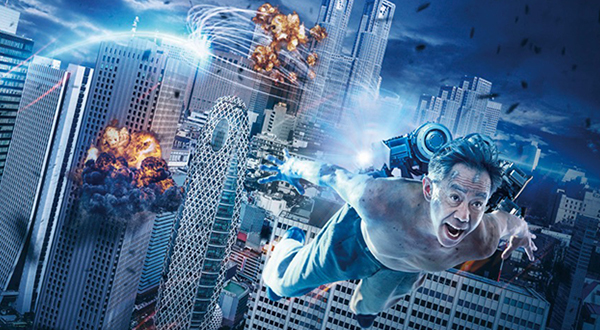 For years, dare I say decades, Japan has attempted to make the kind that Hollywood pumps out, and the end result has been abysmal, and Inuyashiki marks the first legit successful attempt in recent memory. But on top of all that, the aforementioned rampage also manages to tap into J-horror tropes, and brilliantly so. 2018′s New York Asian Film Festival will be the year in which my faith interest in Japanese cinema has been completely restored, thanks to films like Liverleaf, One Cut of the Dead, and now Inuyashiki. Can’t recommend it enough! And not just cuz I’m a sucker for a good super hero flick… though it definitely plays a huge part. Inuyashiki is the first film of the final day of NYAFF 2018, Sunday July 15, 1:00pm at the SVA Theatre.